NIT Silchar Recruitment 2018 : We, the Assam Career Team is happy to inform you that Assam’s Leading Technical Institute National Institute of Technology Silchar has recently issued a recruitment notification. Accoridng to the this latest NIT Silchar Recruitment 2018, a walk in interview will be held for the recruitment of Library Trainee at NIT Silchar. Please note that the post is purely temporary. More details about the NIT Vacancy is shared below. In this section, we will explain in detail about Recruitment of Library Trainee Under NIT Silchar Recruitment 2018 with all the details and requirements . Following are the details of the post under National Institute of Technology Silchar vacancy. (ii) Working experience on Koha – Library Management Software for more than 5 (five) months or Koha Certificate from NISCAIR/ INFLIBNET. 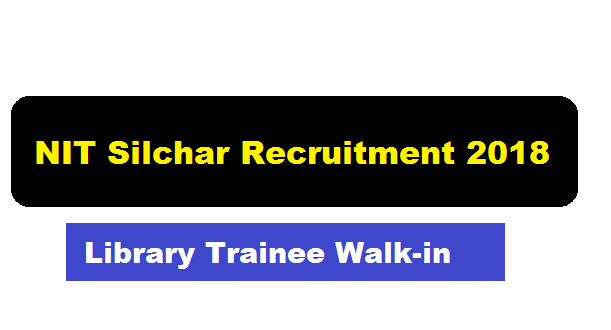 As you already know that NIT Silchar going to conduct an interview for selecting the position of Library Trainee post. Following are the details of Interview under NIT Silchar Recruitment. Interview Venue: RPC Hall, NIT Silchar. Interested and Eligible candidates are requested to appear with their bio data along with two passport size photographs and self-attested photocopies of all testimonials in support of their claims. They must bring the original documents and testimonials for verification at the interview venue.